Recently I had the opportunity to chat with Firm Faith Watson. If you don’t know her, you should! Her title is Director of the Faculty Development Center at Murray State University, but she serves more than just the Murray State community. She has created the This Works for Me Virtual Summit, a series in which she interviews various academics about … well, about what works for them! The youtube channel is here. My contribution to the series is on the topic of peer review. We don’t talk about peer review all that much in academe other than to complain about Reviewer 2 (who maybe isn’t so bad after all), but we should! I became a better writer. Yup. I learned from what other people did well, and what they did poorly. I learned what manuscripts look like before and after they get published. 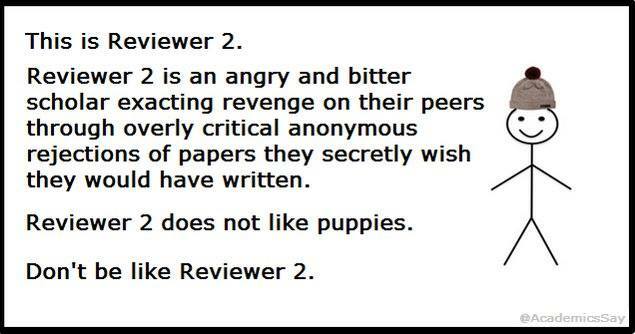 I learned from the feedback other reviewers provided on the manuscripts I reviewed. I took what I learned, and applied it to my own work. I became an editor. The path went from reviewer, to guest editor (sure, why not?) and editorial board member (aka super-active reviewer, to associate editor (like guest editing, but more), and finally to editor-in-chief (eek! I’m in charge here!). Anyway, I won’t give it all away here … soon enough my video will be posted. Hames, I. (2012). Peer review in a rapidly evolving publishing landscape. In I. Bothwich, E. Pentz, & R. Campbell (Eds. ), Academic and professional publishing (pp. 15-52). Sawston, UK: Chandos Publishing. If you have peer reviews to respond to, that means you submitted something. A great start! Reviews help you know what strengths and weaknesses someone else saw in your work. Sometimes it’s much heavier on weaknesses, which makes sense: The peer reviewer’s job is not to compliment you on what you did well, but rather to help determine how to get the manuscript up to publication quality. Sometimes you get peer reviews and an invitation to resubmit. In that case, you’ll need to enter a dialog with the editor and peer reviewers. Here are some guidelines for writing your response. Hilten, L. (2015). 3 top tips for responding to reviewer comments on your manuscript: An editor and publisher highlight the dos and don’ts when providing feedback. Mudrak, B. (n.d.). Responding to peer reviewers: You can’t always say what you’d like. Noble, W. S. (2017). Ten simple rules for writing a response to reviewers. PLoS Computational Biology, 13(10), e1005730. Showell, C. (n.d.). The final hurdle: Persuasive responses to peer review. Rejection can be difficult to handle — but know that when you get rejected you’re not alone! We all get rejected (even the most senior, renowned scholars experience rejection). Once the sting subsides, figure out what can be learned from the rejection (and any feedback you received with it). Why? Because selecting the right journal for your paper matters! If you choose one that’s not a good fit, you’re sure to get a desk reject. Knight, L. V., & Steinbach, T. A. (2008). Selecting an appropriate publication outlet: A comprehensive model of journal selection criteria for researchers in a broad range of academic disciplines. International Journal of Doctoral Studies, 3, 59-79. Stoilescu, D., & McDougall, D. (2010). Starting to publish academic research as a doctoral student. International Journal of Doctoral Studies, 5, 79-92. Are there any resources you would add? Please share in the comments! This entry was posted in editor life, writing and tagged academic publishing, peer review, resources by vdennen. Bookmark the permalink.